A dispute has broken out between conservationists over the release of captive choughs into the wild in Cornwall. Six birds have been released by a team from the Paradise Park Wildlife Sanctuary, near Hayle, at a secret location in the county. Their release was the culmination of Operation Chough - a project set up by the privately-owned sanctuary 16 years ago with the aim of returning the birds to Cornwall. 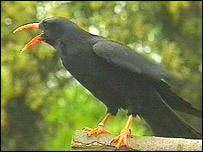 But English Nature and the RSPB say the release could harm the county's small colony of wild choughs - the emblem of Cornwall. 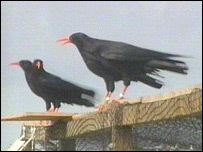 RSPB spokeswoman Emma Parkin said the captive birds posed a risk of disturbing the wild choughs or passing on diseases. "This could be a very irresponsible act on behalf of Paradise Park. "Our main concern is that it will jeopardise the well-being of the existing wild population in the county," she said. Officials from English Nature say they are angry and disappointed and fear a potential mixing of blood lines. John Holmes, from English Nature, said: "The birds kept in captivity may have become used to being fed by humans and we think there is a risk they may pair up with wild birds on the Lizard and disrupt their natural behaviour." But Paradise Park founder Mike Reynolds said the captive birds' release had been a success. "We think that eventually our group will meet up with their group and make a much stronger breeding population so the chough can really get established in Cornwall," he said. "They disapprove of a private organisation like ours taking the initiative to restore the birds to Cornwall." The newly-released birds are to be monitored with the help of radio tracking devices over the coming weeks. The chough, a member of the crow family, has distinctive red legs and a long, red bill. A pair of the wild birds returned to Cornwall in 2001 after an absence of more than 25 years. The Cornish Chough Project was set up between the National Trust, RSPB, English Nature and Defra to create the right conditions for the wild birds' return. "The release of the birds was the realisation of a long-held dream for the team at Paradise Park"